Among earthquakes and hurricanes Mexicans and Puerto Ricans are going through a crisis that requires our solidarity. Organizations, groups, individuals across the country and in the Hudson Valley have mobilized to help. For example, several town clerks' offices in Sullivan and Orange Counties have decided to join in collecting donations to Puerto Rico. The offices of the municipalities of Bethel, Blooming Grove, Callicoon, Chester, Cornwall, Crawford, Deerpark, Forestburgh, Goshen, Highlands, Liberty (Call Laurie Dutcher al 845-292-5110 for more information on Liberty), Minisink, Monroe, Montgomery, Newburgh, Tuxedo, Wallkill y Warwick, are all places where donations are welcomed until October 13th. The Orange County Sheriff’s office in Goshen is another collection center. Items needed: bottled water, aspirin, diapers (adult and children), bleach wipes, baby wipes, baby formula, batteries (all sizes), flashlights, nonperishable food, can openers, feminine hygiene products, soap, toothbrushes, toothpaste, and repellent. Donations for Puerto Rico can also be donated to the Cilantro restaurant in New Windsor, says Gisela Gómez, who has already shipped several cargoes through Jet Blue. The Grupo Folclórico in Poughkeepsie, R-volución Radio, Felipe Santos, Yéssica Hernández, Mirna Guevara, Amancio Salazar, Joel Posadas and many other people from the community, along with Hispanic stores in Newburgh, Middletown and Kingston (which serve as collection centers), have been collecting and packing donations to send to Mexico City, Puebla, Oaxaca, and Chiapas. How does this work? From the collecting centers, they count and categorize every donation among Poughkeepsie, Kingston, and Passaic, NJ. 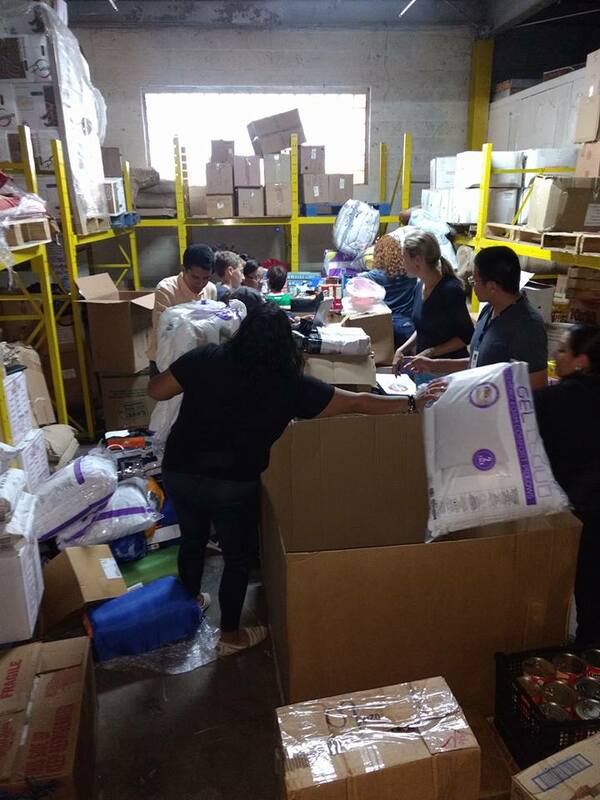 Through Aeroméxico and with the help of the Mexican Consulate and Mexican Foreign Ministry, the donations can be sent without cost to Mexico. The agency Sedesol and the organization Casa del Migrante in Oaxaca are in charge of the distribution in different zones. The Tri Sate area of NY, NJ, and CT has now sent more than 10 tons of packages to Mexico. They have received so much solidarity that it is hard to keep up with. At the last count, Santos said there were 50 pallets of donations in Passaic, NJ, waiting to be counted and packed. Volunteers are needed for this task. Please contact Felipe Santos or Aline Valdez Zamora through Facebook to get involved. Santos explains that they ask for people to cross out all bar codes on the donations with a permanent marker and to write phrases like “United for Mexico,” Strength for Mexico,” “I love you Mexico,” or “Donation” in order to ensure donations are not diverted from their original destination. Santos also says it is important to monitor what is being sent from the Hudson Valley to ensure that these donations to Mexico are not re-packaged /re-labelled by other organizations. Emissaries have already sent photos and videos of some deliveries in Oaxaca, where they have asked for bait gloves, bed sheets, pillows, mats, sleeping bags, tents, and other articles mentioned above. Amancio Salazar, (who has also collected donations for Puerto Rico), also tells us that due to the skepticism of the Mexican government, they have decided to collect money that Mr. Francisco Martinez from Newburgh will be carrying directly to Puebla to buy what is necessary for the areas most affected. Independent journalist Andalusia Knoll, (twitter.com/andalalucha), currently in Mexico City, informs that she has been a direct witness to the corruption of the government in terms of donations. To avoid governmental agencies, Knoll recommends sending money to The National Indigenous Congress. Among its members are the Zapatistas and they are strong advocates for indigenous communities hit hardest by the earthquake. More information can be found here. Knoll also suggests to send money to Francisco Toledo’s foundation in Oaxaca or through Diego Luna, Gael García Bernal y Documental Ambulante or directly to a family member or trusted friend in Mexico who can buy the supplies that are needed the most, like boots, saws, and other tools.